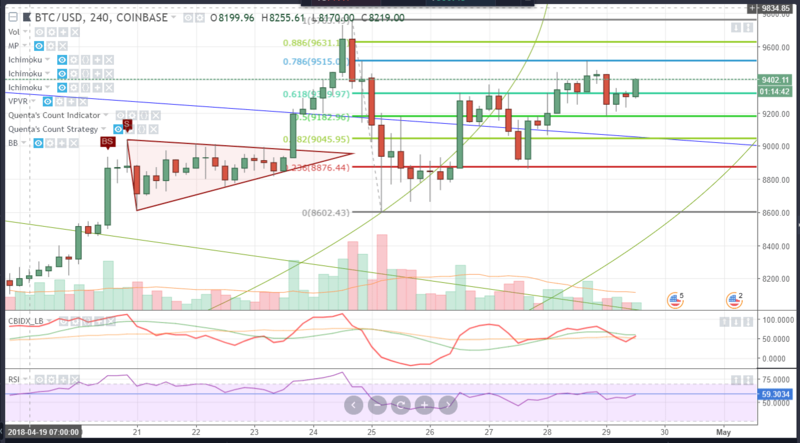 Bitcoin’s price action from the close of the normal equity markets on Friday, April 27th to Sunday, April 29th (1747 PM currently) has shown some very, very bullish signs. Signs that point to the very important $10,000 value area being reached. The Mr. Gox conservator, rumor has it, sold the remaining Bitcoin to another buyer below the market price. That news could and would certainly draw some short-term selling. But. And this is a big deal. No noticeable short selling. I took a look at the short interest on the exchanges that allow shorting (Poloniex, Bitmex, Bitfinex, etc) and there was almost no short interest being generated during that fall. It was just long liquidations, a.k.a., buyers taking profit. You can pull up the BTCUSDSHORTS Bitfinex charts yourself on Tradingview. Now, what is equally fun to watch is the activity over this weekend. Short interest has increased, but for first time since the all-time high, the short interest has been unable to really keep Bitcoin down. Bitcoin has tested the 50% Fibonacci retracement from the previous swing high and swing low. Price is above the 50% retracement. Bitcoin has tested, rejected, tested again and moved above one of the most important Fibonacci retracement levels: 61.8%. Generally, on a multitest of the .618 Fib level that fails to turn price back, it is a very bullish sign. What we can expect as prices move higher is a short rally. I don’t know how much of a short rally will occur, but there will be some new traders who have had success shorting Bitcoin and will now get really, really hurt when they learn all about margin calls. It’s a win-win for longs.